The Specialities Of Awadhi Cuisine – What It Is? The delicious tradition of Awadhi cuisine originates from Lucknow, the capital city of Uttar Pradesh in the northern region of India. Following in the culinary footsteps of the mighty Mughal empire, with its innovative dishes and cooking techniques, the kitchens of Lucknow draw inspiration from classic Indian recipes as well as the cooking culture of Central Asia. The art of cooking is taken seriously in Lucknow, in the same way as in the regal kitchens of the Mughal maharajahs. There are three distinct traditions of cooks in the city. First come the bawarchis, responsible for cooking vast quantities of food. Then we have the rakabdars who produce gourmet portions, perfectly presented and garnished. Finally, the nanfus create an assortment of flat-breads, from naans to chapattis, roti to kulchas. A ceremonial Awadhi feast is known as a dastarkhwan and is a serious business. The finest delicacies are laid out in an elaborate spread for diners to share, with different cooks taking responsibility for different parts of the meal. A dastarkhwan is a fantastic experience to sample the sheer variety of dishes and ingredients that makes Awadhi cuisine so popular and so unique. Chaat, the small, savoury snacks we might be used to ordering as starters in some of London’s best Indian brasseries, were developed out of the culinary tradition of Uttar Pradesh and have become a stalwart of street food stalls and vendors all over the country. The original chaat incorporates parcels of golden, fried dough, stuffed with chunks of potato or chickpeas, liberally spiced and served with chutneys or dahl. 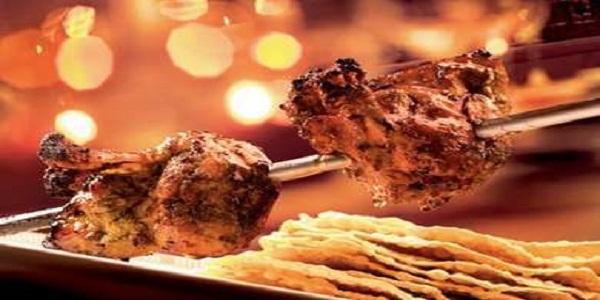 Awadhi cuisine is also famous for its imaginative kebabs, marinated to lock in juices before getting grilled to barbecued perfection over hot charcoal or on a chula. Minced mutton, beef and lamb are all popular options for kebab meat and there are also adventurous vegetarian recipes available, utilising Indian yams, beans and raw jackfruit as main ingredients. After savouring some crispy chaat, it would be no surprise to fiind your appetite crying out for a curry. Awadhi specialities are closely linked to the Mughal tradition of mildly spiced yet deliciously creamy gravies. The silky sauces of lavish kormas are made rich and thick with ground nuts, ghee and cream. This is a culture that savours its flavours and denies itself nothing. Murgh Awadhi korma is thought to be the speciality curry of Lucknow. Curries would nearly always be accompanied by some form of flat-bread, the staple food of Awadhi cuisine. From naans to rotis, kuchas to chapattis, these tasty breads are ideal for dipping into sumptuous gravies or savouring with chutneys, daal or a dollop of melting ghee. Another signature dish is the famous Lucknow Biryani, a classic dish that mixes meat, vegetables and basmati rice with yoghurt and spices to form a complete meal in one. Usually the different elements of the dish are cooked separately before they are layered and cooked on a low heat until ready for the table. Finally, the signature dessert of Awadhi cuisine, if just one can be chosen, would be the halwa. Many variations of this dessert are enjoyed in Lucknow utilsing different cereals as well as dried fruit, nuts, milk and plenty of sugar. To try any of these simply head to one of London’s best loved Indian brasseries. ← How Much Should I Be Educated To Start A Career?